You must make reservations at least 5 minutes in advance of the time at Magnolia House. Music entertainment is presented by Prism DJs, whose roster of female DJs create a cool, upbeat atmosphere on Friday and Saturday evenings. The lineup of DJs consist of Prism’s founder Tessa Young, KCRW radio host Marion Hodges, Master of the Mix contestant and radio personality K-Sly, remix producer VOOMZ, plus many other talented female DJs. Come groove with us to a mix of indie dance, current hits, hip-hop, throwbacks, classics, and remixes! Our lounge area is complete with cushy wrap-around couches, cocktail tables and plenty of quirky artwork. It’s the perfect setting for a cocktail-style mixer or party and can accommodate up to 20 guests comfortably. Parties slightly larger are able to spill over into the adjacent bar area. Please e-mail events@themaghouse.com or call us after 3pm to speak with a manager about reserving the space. 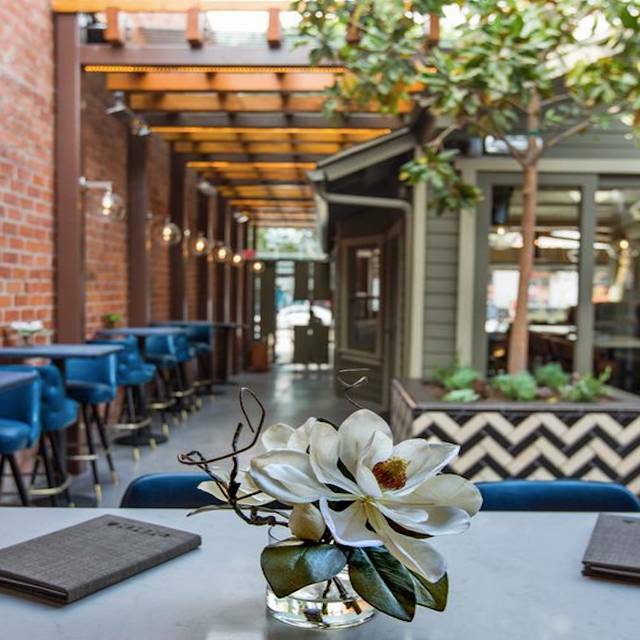 Located in a 100-year-old Pasadena craftsman bungalow, Magnolia House offers unique handcrafted cocktails, a boutique selection of wines, and local craft beers on tap while the menu boasts market-driven selection of seasonal shareable plates. *Please note: We accept reservations for brunch service every Saturday and Sunday, but have limited reservations available during the week. If your desired reservation time is not available, we’d still love to have you! Walk-ins are always welcome. The restaurant ambience, service, and food were amazing! The only downside is that with the heavy big furniture seating, the aisles seem really crammed and servers kept bumping into us or the other table behind us. Food was delicious. It’s a bummer they don’t tailor to kids because they food would be suitable for little ones. We still had a great time. Perhaps the owners should invest in a couple of booster seats. Other than that, we had a fabulous time. Always friendly, good value. Since ambiance. We had very high expectations based on reviews and were disappointed by the reality. Food was mediocre and vegetarians in our party had few options. Cocktails also just okay, despite the assertion "we're known for our cocktails." Slow service. And what might have been a really nice ambiance was ruined by someone's incomprehensible decision to hang TV sets throughout the restaurant. We weren't prepared for a sports bar and, although athletic events weren't being shown, that's what it felt like. There are plenty of places for people who can't stand to be separated from TV -- we were so disappointed to find that Magnolia House was one of them. Great decor but bad service. Place is great for a date night or friends meeting up for happy hour or brunch. But not so kids-friendly, they don't even have high chair or booster seats for baby/toddlers. I would thought brunch would be more of family flare, but guess not. Food is great, service is so-so for the price. Excellent staff accommodating for a surprise birthday dinner for my wife. Very friendly staff and delicious food, excited to come back soon! Top notch food and service. I love the bar staff. The best in town. Thank you!! Magnolia House is good for happy hour or a date. Great service and tasty, fresh tapas. The menu has mostly light fare to share and the ambiance is cool- with several different types of seating. This was my first time at Magnolia House. Food and service were both great. Will definitely be back. Went for Sunday brunch. From the moment we checked in to the time we left, service was friendly and attentive. The food was delicious and the drinks marvelous. The music was loud enough so we could chat and have a fun time. Had brunch. Great service, delicious food, reasonable prices for drinks. I had the rosè drink delicious!! The restaurant was super cute cottage type vibe. We will be back! Had Saturday brunch and loved it, the food was delicious, the servers were fantastic. They really worked with me regarding the allergies I have and were very understanding for the substitutions I had to make. Excellent as usual! Best happy hour with sangrias that are a bomb! Best eggs Benedict I ever had. This is an interesting place. Not a "dinner" place in the traditional sense. Mostly ala cart menu. Food is very good. The day we were there it was hot. They left the large window in front open and the inside temp was near unbearable. Nobody would sit near the window, too hot. They finally closed it and it began to get cool. The tables are very close together, and small. It seemed cramped and a bit noisy. Crowd was mostly hipsters, millennials. The venue was amazing. I loved the drinks, food, and ambiance of it. Perfect for summer dinner and drinks. I need to try the brunch next! Fun spot, great food, excellent ambiance. Highly recommend. Free street parking on Sundays is great too. We really loved the venue, but were sadly not impressed with the breakfast food. The fruit salad was not fresh, the hash browns were generic, the egg mushroom dish was stingy on the mushrooms. Also, we sat in the middle section and felt like we were blocking the path from the kitchen. I kept moving my chair in as I was worried that they wait staff wouldn't be able to get by. We were hoping for a new breakfast place, but didn't find it here. Went to Happy Hour at the place. They have really great serving staff. Food was very yummy. I had a Rose cocktail and they have specials every week. The food menu was impressive. The music was a little too loud since I can hardly hear my friend's over the music. They only do reservations between 4pm - 5pm for HH. Which is weird. We came to brunch the morning after Taylor Swift. I just love Magnolia and was happy to finally share it with friends! Magnolia House itself was fantastic! The problem I had was with the Reservation/Hostess. I met the of my party there at the restaurant. When I got there, I told the hostess I was meeting the others of my party there and that we drove separate. The hostess told me she had no reservation for me. I told her I made the reservation for 10AM brunch and she said she had no 10AM reservations. Luckily at that point my brother texted me telling me they were already seated. So I told her, that they said they were already seated and she then told me I was free to go ahead and look for them myself. Ummm... kind of weird and kind of rude. Service was outstanding. Perfect thoughtful reserved table. We asked for our server to take a photo and he already knew what angle to get the best lighting. We asked about a drink and he offered to bring samples to the table for everyone to try. Great experience. Went to Magnolia House for Brunch and had a delicious Eggs Benedict. This place is cute and has very comfortable ambience and great food and service. Great Place to meet for good conversation and totally worth the drive. The food here is very tasty, the cocktails are top-notch, and the portions are sized correctly (I did not want to die after brunch like I so often do because I'm one of those people who stupidly eats everything in front of me). The only issue we had is that our waitress very carefully made sure to understand our friend's order, but then that understanding got garbled somewhere along the line (an "extra poached egg" meaning a third egg in addition to the two already in the eggs Benedict turned into "extra poached eggs" meaning the eggs were hard-poached and there were only two of them) to the kitchen and the server. We enjoyed the happy hour drinks a small plates. Our server, Emily, was friendly, witty, and attentive. The whole experience was awful, beginning with trying to make a reservation. There were no reservations available for the time we wanted so we went an hour earlier since we could get a confirmed reservation at 10:15am. However, we were still there (because of the very poor service) at the time we had originally asked for and the place was empty! I waited 20 minutes for someone to come by the table so I could ask for coffee. When it arrived, it was so WEAK that I had to send it back. The next batch was so STRONG that I could not drink it. The wait staff were pleasant but hardly visible. When we finally got our order taken, it took 45 minutes for the food to arrive. I couldn't see our waitress anywhere. Finally, a manager came by and apologized for the delay because of a "situation" in the kitchen. Our food must have been sitting there in the kitchen for a long time because the potatoes were hard and the fruit mushy. The manager offered us a mimosa in compensation for the delay. And then, even though I had registered this as a birthday, and mentioned it to at least three of the staff, there was no acknowledgement of my friend's birthday at all. I will not be returning to this restaurant. Enjoyable for a friends get together for happy hours. Parking is lacking but street parking is available if you can find. Bar drinks and happy hour food menu is great. Casual atmosphere. Great place to hang out. Service was excellent as well as the food and cocktails. Will be back again, mostly for the service that exceeded expectations. Server was very personable, and friendly. Her service was of the utmost professional. Food was served fast and hot . They stood behind there recommendations, and were not wrong . The drinks were made perfectly as advertised. Great ambiance, service, food and drinks. I had wanted to try Magnolia House because of the historic location but I’ll go back because the food is SO GOOD. 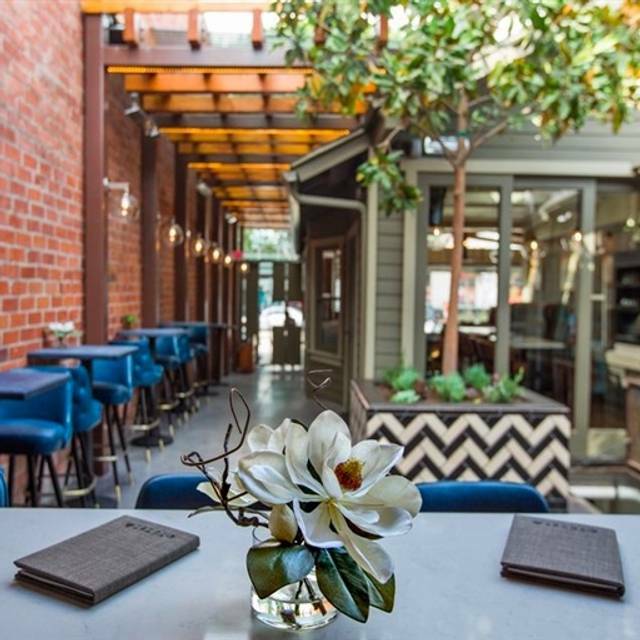 There are all kinds of different sections to sit in, each charming in its own way, and a really eclectic small plates menu with something for everyone. My daughter was our designated driver and even she found a really tasty non-alcoholic cocktail. We are definitely adding this to our Pasadena must list. I came here with my girls for a mimosa brunch. We got seated right away and service was fast. We enjoyed our time here and will come back again. This is a comfortable restaurant. Like visiting someone's house the arrangement of the vignettes lends to good intimate casual conversation groups. The food was generously proportioned for the small plates and the selection of craft beers was good.The noise level was a bit loud for us and we had trouble conversing sitting across from each other but overall the experience was enjoyable. This is more of a quick casual Happy Hour venue than a fine dining restaurant but one could linger in a pleasant environment. Fireplace seating very cozy and fun for girls night out! This was my first time at this restaurant and I wished I lived in the area so I could visit more often. The chicken and waffles were delish.